FAYETTEVILLE, Ark. – University of Arkansas alumna Beth Beavers Prescott remembers the smell of blueprints in her father’s office. “My dad was an architecture guy,” she said. Prescott and her husband, Hal, are honoring her father’s career in architecture, his impact on Eastern Arkansas and his love for the U of A with a $50,000 gift to create the Bob J. and Virginia Beavers Advance Arkansas Endowed Scholarship. Named after Beth Prescott’s parents, the scholarship is intended for high school graduates from St. Francis County and the Arkansas Delta. Their gift counts as part of Campaign Arkansas, the university’s $1.25 billion capital campaign, and will enhance student success for Arkansans. Bob J. Beavers started his journey at Little Rock Junior College (now the University of Arkansas–Little Rock) before marrying Prescott’s mother, Virginia, and transferring to the U of A. As a student in the then-School of Architecture, Beavers studied under Fay Jones and John G. Williams, whom Beavers referred to as “Teach.” Virginia, a graduate of Little Rock Junior College, worked for Washington Regional Hospital and Dr. James Mashburn in Fayetteville to put her husband through architecture school. Bob and Virginia were high school sweethearts and were married for more than 60 years before passing away in 2017 and 2018, respectively. From an early age, Prescott remembers her father’s love for the University of Arkansas and his commitment to supporting the Razorbacks. Prescott attended Hendrix College for her undergraduate degree and came to the U of A for law school. Her brother, Brad, also received his undergraduate and law degrees from the university. Bob J. Beavers enjoyed a successful career in architecture and settled in Forrest City, where his children grew up. He worked extensively with Cromwell Architects and opened the firm’s East Arkansas branch in 1963. In 1980, he was named president of the firm’s Memphis branch, which was later sold and renamed Beavers Smith Langford Mundinger, or BSLM. He retired from the firm in 1997 and formed Bob J. Beavers AIA Inc. three days later. Beavers designed and built many schools, health departments, churches, courthouses, banks, hospitals, residences and more in Eastern Arkansas. 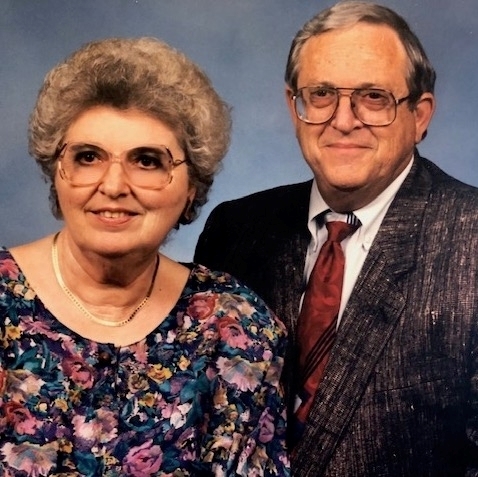 Because of this, Prescott and her husband felt compelled to support students who are high school graduates from St. Francis County and the Arkansas Delta with the scholarship named in her parents’ honor. Similarly, the Prescotts chose to support the Advance Arkansas scholarship initiative because of Beth’s father’s experience as a college student. The Bob J. and Virginia Beavers Advance Arkansas Endowed Scholarship will support new students from Arkansas who exhibit financial need. First preference will be given to students enrolling in the Fay Jones School of Architecture and Design. Hal and Beth Prescott are life members of the Arkansas Alumni Association, where Hal Prescott serves as director of finance. Beth Prescott is a 1986 graduate of the School of Law and is a budget coordinator for the United States Postal Service. They are counted as Thoroughreds for their consecutive giving to the University of Arkansas.